THE OPENING is all about delving into the fascinating, quirky and wonderful visual arts in Vancouver. Each week we’ll feature an artist, cover an exhibition, discuss a lecture and everything else in-between to delve deep into who and what makes art happen! Earlier this year, Emily Carr graduates Soledad Muñoz and Conrad Sly captured the attention of exhibition-goers with their collaborative installation, Field Work. Secreted away inside of a dim classroom, Field Work was entirely absorbing and strangely futuristic. Planes and plinths in ‘green-screen’ green served as visual anchors in a peaking swirl of rendered graphics, archival video, and the omnipresent buzz generated by Muñoz’ black cross, whose thatch of charged copper wire would register minute changes in its environment — movement by, say, an inquisitive viewer — and relay them back into sound. My initial encounter with Field Work left me curious and enthralled; the twisting renderings of mountain ranges, the initially inexplicable presence of John Diefenbaker, and the way in which this ominously hovering X could prickle the fine hairs on your skin with its murmurs and howls stayed with me long after the Degree Exhibition came down and Field Work, in its first iteration, was dismantled. In hopes of unlocking some of the many mysteries folded into Field Work, I met up with Muñoz and Sly at Sunset Terrace, an archetypal artists’ studio whose clean gallery storefront belies the visual cacophony of a hundred works in progress inside. Sitting on stuffed armchairs towards the back of the space where a garage door was rolled up to let in a big swath of air and light, Muñoz and Sly schooled me on the affective potential of technology in art, their plans for the future, and how important it is to be bolstered by a strong creative community. Soledad Muñoz & Conrad Sly at Sunset Terrace. Photo: Alex Quicho. VIA: Tell me about your process. Soledad Muñoz: We worked separately. [Field Work] came about because we had to apply for our [grad show exhibition space]. Another girl got the space that we initially wanted, but we got moved into a second room together and we thought that it would be good to collaborate. When I saw Conrad’s piece, I altered my sculpture so that they would have a conversation. We started moulding things so that they fit together. At the end, we were surprised at how the pieces responded to each other. Conrad Sly: It happened slowly because we were always unsure as to how that space was going to turn out — they might’ve moved somebody else in there. We wanted to use the whole room, which we ended up doing, but we were sort of testing things out and seeing how we could use the space and fit things together in it. Field Work (Intangible Fields & Northern Destiny), installation shot at ECUAD. Photo: Conrad Sly. VIA: It’s surprising that such a cohesive body of collaborative work was conceived of so separately. SM: I mostly do sound art, working with sound as mass. That was called ‘Intangible Fields’ because the intangibility was actually — this was the piece in a way. His aesthetics were strong and they for sure complemented the cross, which would have been so empty without everything else in the room. The intangible fields were fueled by this drone, and the patches on SuperCollider that were in the entrance, which added another layer upon that. But visually it was all Conrad, for sure. CS: And the missing piece in my project for sure was this connection to this raw soundscape of the electromagnetic field that Soledad’s piece tapped into. My animations and the video that I appropriated of John Diefenbaker giving a speech about Canadian unity and how it relates to the history of Canadian art and landscape art all tied in together. VIA: Could you speak more about what attracted you to this subject matter? CS: It began when I came across these high resolution images of Group of Seven paintings on the internet. Having seen them previously in real life, the aura of the art object was transformed digitally into this frenzy of possibilities that could be achieved with the images – as opposed to the rather static aura that surrounds the actual paintings. I wanted to take from the digital format all the possibilities that could be achieved with those images and the landscape that they were connected to digitally through a network that spans the whole planet. It transformed the role of those images and those paintings. The affect of beholding these high resolution iconic images on the internet was illuminating because their multiplicity in time and space creates a buzz that brightens the aura of their objectivity. For instance, the large projection on the wall features a reproduction of A.J. Casson’s painting Little Island (1934), which I downloaded and generated a terrain simulation with using the coded information held within the image. The image was likely not even a reproduction of the original painting, but of a fake, as a quick google search for this painting yields a plethora of sites dedicated to selling reproductions of Group of Seven imagery. This is the intensity of this ‘buzz’ that I’m referring to, and the degree of simulation occurring today. For me it’s about immersing oneself in this frenzy and finding ways in and out using the tools native to the platform of these experiences. SM: I enjoy having a material conversation with sound. I had this sound in my head that I really liked, which was the drone of the electromagnetic field. It’s a simple process to find it: you make a coil of copper wire that picks up electromagnetic fields and translates them into an audible form. It’s the most simple radio technology. It’s older than TV. It’s a very, very simple idea. I feel like in my process, I don’t really question things a lot. I go to the piece with the same eyes of rediscovering what I did. The other day, I was reading “The Administration of Fear” by Paul Virilio, where he explains these electromagnetic fields as information that eliminates space between human beings. Now, with the iPhone, everything’s connected; our perception of space-time is not the same because we’re eliminating space to create this timeless experience. I was super interested in that. I guess when the work is coming from a feeling and not from the head, you can go back with your head and fill out the spaces. For me, process starts from the feeling and I try to translate that — the head can do whatever it wants. I’m not selfish with the concept; anyone can put a name to whatever they’re feeling. CS: It’s interesting you say that, because one of the main concepts I was working with was this loss of wilderness that was so attached to the Group of Seven. Their legacy was made of this idea that was about being northern and going out into the Canadian wilderness and exploring that and tapping into that. I totally agree — the distance has collapsed or is collapsing. When you can locate yourself on a GPS device, there isn’t a wilderness to get lost in anymore. But, at the same time, there are infinite possibilities with how the digital code that goes into making this network possible is derived from the landscape, essentially. There’s a nice connection there that creates a digital wilderness which swells with the same torrents as the physical. In many ways the wilderness that remains is beyond the human senses, as we require prosthetic computing devices to perform digital analytics, revealing the mysteries of reality or the landscape. SM: The different levels of technology that we were using. There was the coil, which was from the very beginnings of radio, and then we were using current technology such as SuperCollider, which is code-based. It was like both ends of technology in a way, a whole spectrum of it. CS: There was painting, sculpture, and found objects as well. CS: — the speech by John Diefenbaker, which he gave when one of the other Prime Ministers, Lester B. Pearson, wanted to change the national anthem. He had this whole rant about preserving some sort of Canadian identity politics. He was very conservative in that regard, and he was the champion of the Group of Seven for these reasons. My process sort of involved taking images and using all of the light and dark information in those images to create a new sort of landscape — like a height map. I turned that video into a strange, eerie landscape that interacted with Soledad’s piece. I included the speech and placed close to an homage to Marcel Duchamp’s Three Standard Stoppages, to say something about how any spatial awareness brings with it a politics for national identity. The homage was comprised of three found sticks which I painted to resemble the three spatial dimensions as they are typically conveyed in 3D rendering software. The imperfect length and natural curvature of each stick felt like a nice way of defining the space of our installation, which taps into spaces inaccessible to human beings via our immediate senses. SM: When his screen went to white, my piece would go absolutely insane. I have no idea why. CS: There’s still an interesting gap that we have with this technology as we’re using it. Conrad Sly, Montaigne St Victoire Simulation. Photo: Conrad Sly. VIA: That’s what’s exciting about artists getting involved with processes that used to be reserved for scientists and engineers. That fumbling aspect of discovery, which is usually sequestered away from the public, can be explored — you guys, for example, seem to isolate the idiosyncrasies within it, and use that as a point of beauty. SM: Absolutely! And we called it ‘Field Work’, which was a play on that idea. CS: There’s a naïve optimism there, where these technological devices can reference other aspects of art and play off of those. SM: I’m a believer in radical localism and people getting together and feeling and talking. But at the same time, I work with technology; I’m not opposed to it. It’s not the thing, it’s how you use it, in a way. Soledad Muñoz, Structure. Photo: Soledad Muñoz. VIA: What excites you the most about possibilities you can achieve with this new media? 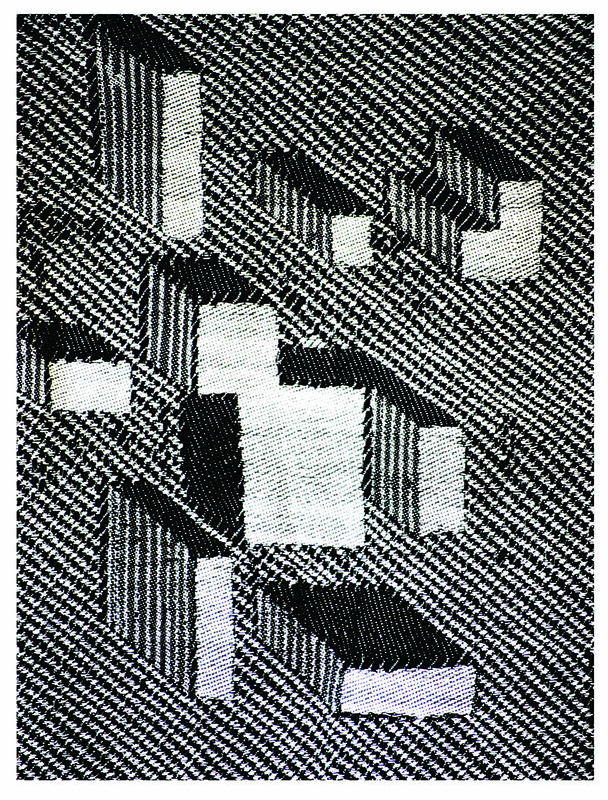 SM: I’m a textile artist — well, I graduated from the textile program at Capilano University — and I see weaving as a technology, and I see weaving as everything I do, in a way. 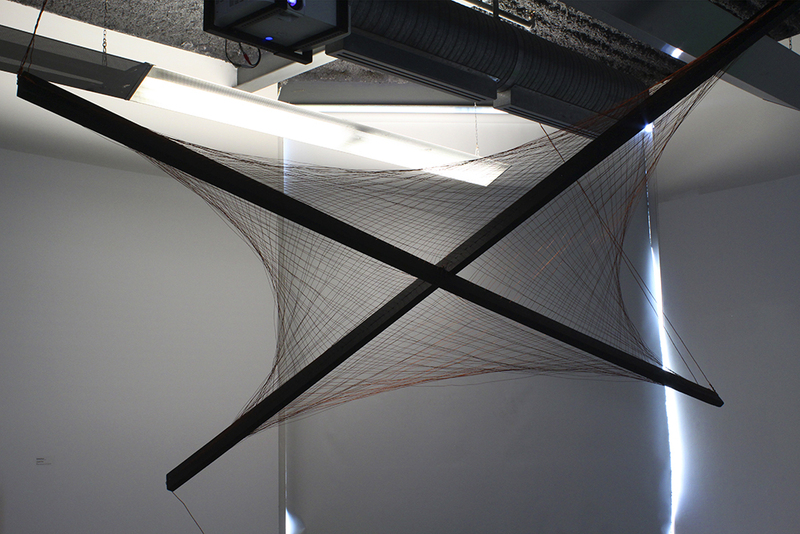 I weave with sound and I see technology through the woven structure — the extension of the being. Technology is a human thing. And so, I guess my exploration would just continue with weaving and sound and community. CS: I agree in that I feel like everything is mediated by an interface of some kind. Understanding and overcoming that interface is part of what it means to be human. I mean, if you eat food, you have that interface of your digestive system! On a computer, we have these digital interfaces, and we don’t really understand what is behind it, fully. You might, if you’re a computer scientist, but most of us are dealing with a gap there. It’s about probing and trying to find out how this gap can be explored, and how deep it goes. To unify the space and create a surface against which some kind of interfacing between objectivity and the digital could take place, I chose to paint much of the space with green screen paint. This paint is typically used in the film industry in the creation of virtual spaces, where actors perform in front of a lurid green screen, the likes of which one cannot find in nature without excessive use of technology. As a form of digital erasure, because the colour is generally so unlike anything else in the environment, it can easily be removed. As such I painted many found objects from the landscape with this colour, and applied this technique to in a video. In all of the places the green paint was utilized I replaced it with a digital remix of a Group of Seven image. SM: But I also feel like there’s a danger in looking at everything through the technological eye and forgetting affect. It’s like looking at a tree and thinking of a table. That’s what I liked about my piece, in that yes, it was technology, but it was talking to affect. If you can get to affect through technology, we’re all good. But if it’s just technology about technology, and that is the piece, just about showing you a cool thing, I don’t think that there’s anything in there. When you get to that affective response, that’s where the magic happens. CS: I have to agree with that. Conrad Sly, Lawren Harris Baffin Island c 1931. Photo: Conrad Sly. VIA: Is there anything on the periphery that you’re excited about as well? CS: I’m excited about trying to pursue understanding about how these scientists are building models that map and simulate climate and radiation and all these things that operate in the background. They have such an impact on her life, but their scope is so grandiose and vast that in a human lifetime we have no real way of understanding, other than through these prosthetic computing devices. That withdrawal from those forces of nature is what drives my interest in art and science and all those things. SM: I’m interested in using art to deconstruct thought and communicate through affect. I know I’ve probably said that word a million times, but I think that my practice is based on communicating outside of language. That’s always what I’m going to try to do. Not only in my work, but in my life. That’s why I really like bringing people together. It’s always about community, relationships, and affect. That’s where my practice is coming from — but where it’s going, I have no idea. Soledad Muñoz, Field Work (Intangible Fields). Photo: Soledad Muñoz. VIA: That was going to be my next question! Are you working on anything new right now? Have you clocked any changes since you made this last piece? SM: It’s been this studio — Sunset Terrace feels like family. I just come here and chill with my friends and make some art. The next step I think I’m going to move from Vancouver for a little bit. CS: I’m really interested in further exploring the relationship between computing and painting and how they can inform each other. I want to build an easel for my laptop so I can use it outside to take the tradition of the Impressionists and the Group of Seven and push it even further that way. I also came across these tiny $45 dollar computers called Raspberry Pi, which are as powerful as a small desktop computer. I want to figure out how I can use these things to construct sculptures and paintings that use them in conjunction with screens. SM: And just continue hanging out and making art. Hanging out is the coolest thing about art, for sure. Get in touch with Soledad Muñoz & Conrad Sly. Follow us on Twitter (@VIAtheOpening).